So I’m sitting here in bed, in the dark… trying to not wake Paul while searching for something intriguing, empowering, or witty to say about the garden with only 18% battery left. Ah, I will just let it be what it is. I will just post the pictures so I can keep track of what is growing in each month. All I know is that it taps something deep and lost inside of me, maybe lost inside of most of us. The sun on my skin, the warm soil between my toes, the green stained hand that smells of tomatoes. This is what really keep the world moving around and what keep me rooted. 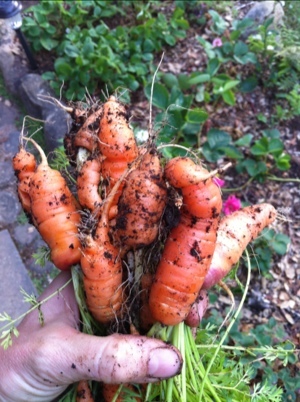 Some of the carrots are big enough to eat. Some, not all. That is a story for another day. I found a volunteer potato growing in the compost. 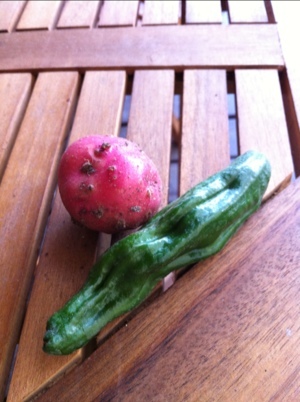 Also the first pepper from the garden was picked the end of May ( one great for mole). 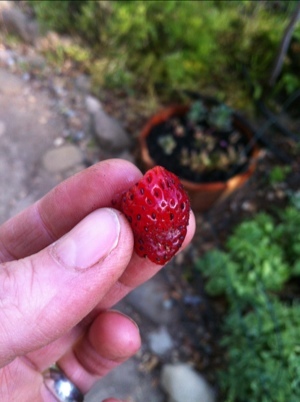 Strawberries (and raspberries) started popping up all over the property towards the end of May and are small delicious bursts of tangy sugar. 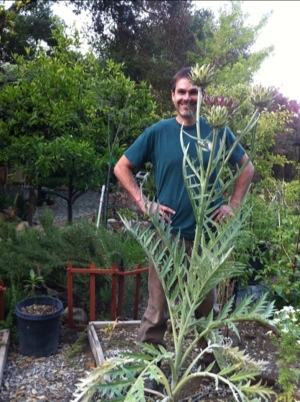 A husband is sprouting up next to the artichokes too! 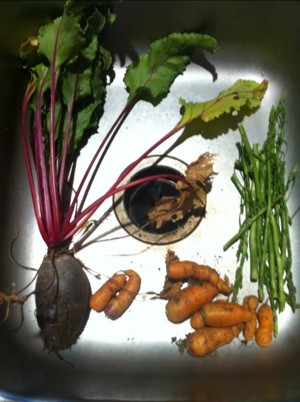 Harvested the first beet the last week of May. The asparagus is dwindling down to a few sticks every few days. Fuji tree with many baby fruits! 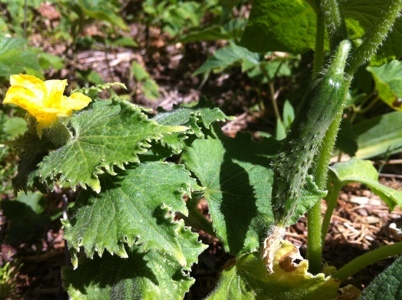 Squash blossoms with a baby zucchini attached. Such a delicate flavor with just a bit of goat cheese slipped inside the petals and baked. My first pickle that looks like it can be used as a weapon. 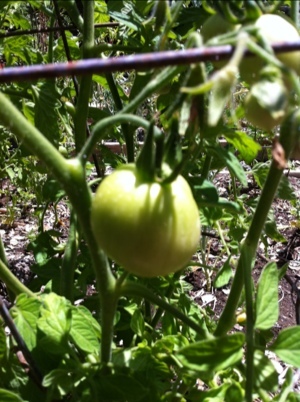 The first tomato appeared early May. 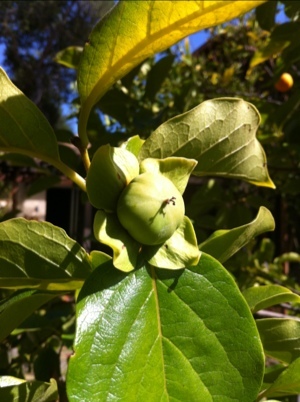 By end of May all have flowers, and about half the plants have some fruits, even the many I grew from seeds. 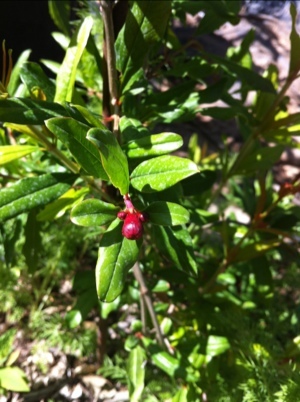 Baby pomegranate tree is fruiting! 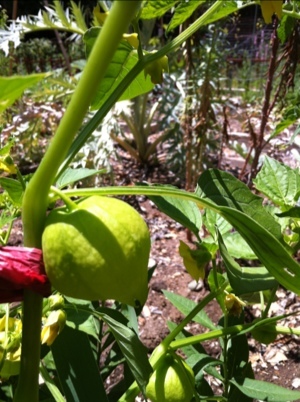 The tomatillos are in pots and doing well here in full sun. 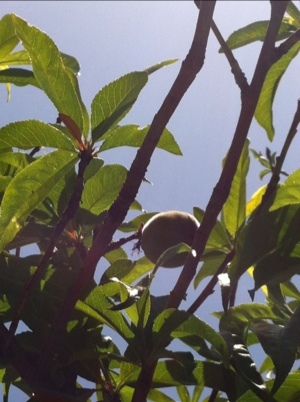 Peach tree with only a few fruits. Hatching locusts leaving their creepy body shells all around. 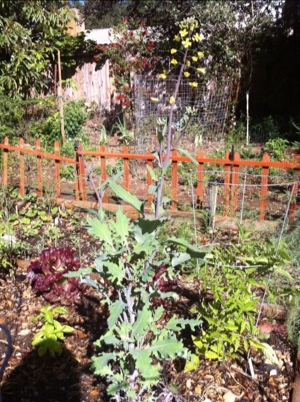 Too hot for kale- everything bolted. 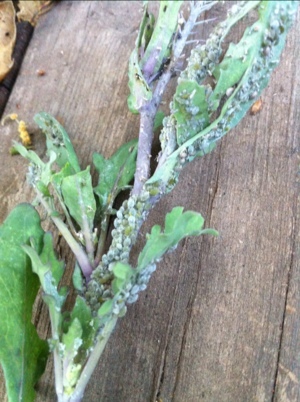 I was gong to let the kale go to see but the aphids took over. 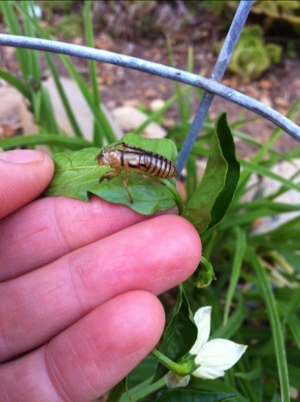 There were the only plants in my whole garden so far that became infected with any kind of insects so far. 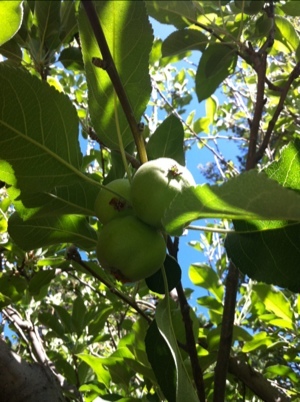 We discovered an apple tree along the side of the house. Turns out the squirrels already knew. 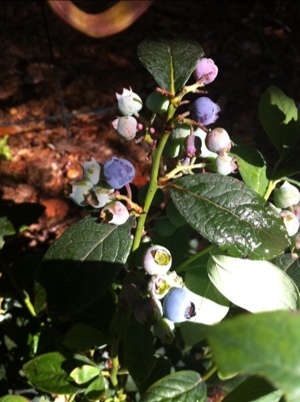 Blueberries continue to slowly, ever so slowly, ripen. I can eat one or two every now and then. 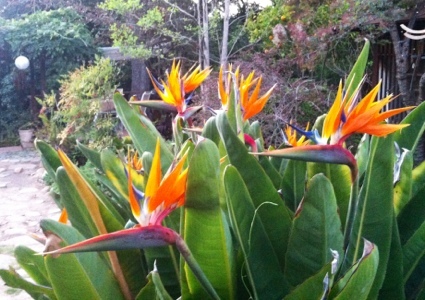 Birds of Paradise were in full bloom all month. The one on the corner started a week or two in advance. By end of May they are shriveled up. What broccoli looks like in the heat…meaning over 80 degrees. Bolted and flowered. 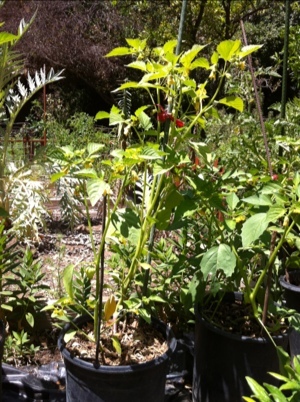 I am going to see if I can snag some seeds and plant again in fall when cooler weather is here. 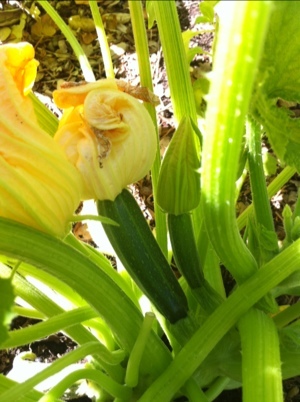 Mmmm… squash blossoms… haven’t had those in years. I love your garden, Heather… your chubby carrots, volunteer potatoes and strawberries, beautiful blueberries… even the aphid trap-crop of kale and and your wise, industrious squirrels. Thanks for sharing!